Application is simple, whether by hand or with a buffer; apply, let dry to a haze and wipe off. Use once per year to keep new and restored boats looking their best. Ideal for all fiberglass, metal, glass or painted surfaces. Note: if surface is oxidized or hazy, use One Step Heavy Duty Cleaner Wax with PTEF. The ultimate protection for fiberglass, metal and painted surfaces. Maximum UV Protection and Shine. 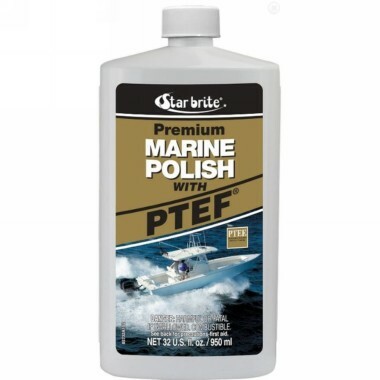 PTEF is the slickest, non-stick material ever developed - it repels water and oil based stains and deposits, making future cleanup quick and easy. PTEF is Star brite's registered trademark name for polytetraflouroethylene.